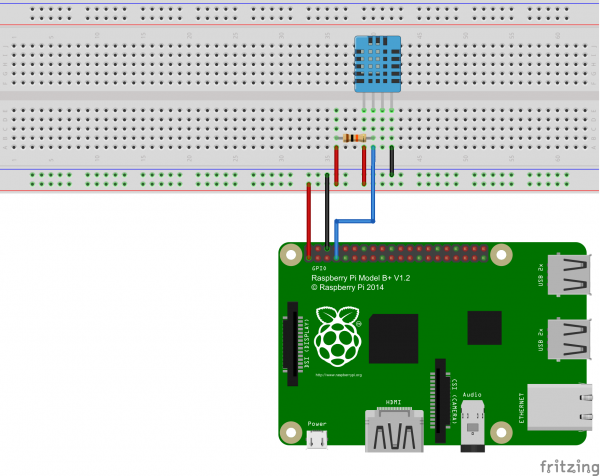 With the Raspberry Pi and some sensors, it is easy to measure the temperature without much effort. In addition, however, the humidity in certain situations or projects (such as a weather station) can be enlightening. Sensors such as the DHT11 and DHT22 are not only available for a few euros, but they can also measure the temperature as well as the humidity. You can see the difference between DHT11 and DHT22 here. As a result, the DHT11 (blue) is cheaper, but the DHT22 (white) is more precise and lasts longer. For applications in “extreme” areas (0-20% or 80-100% humidity), the DHT22 should be used, as it also supports these areas in contrast to the DHT11. For example, I have a DHT22 sensor in my fridge to measure and log temperature and humidity. In general, the 11er model should also be enough. The left pin of the sensor is connected to 3V3 of Pi (pin1), the second sensor pin via a pull-up resistor (4.7k – 10kΩ) with a free GPIO of the raspberry (GPIO4, pin7) and the right senior pin comes at GND (Pin6) from the Pi. 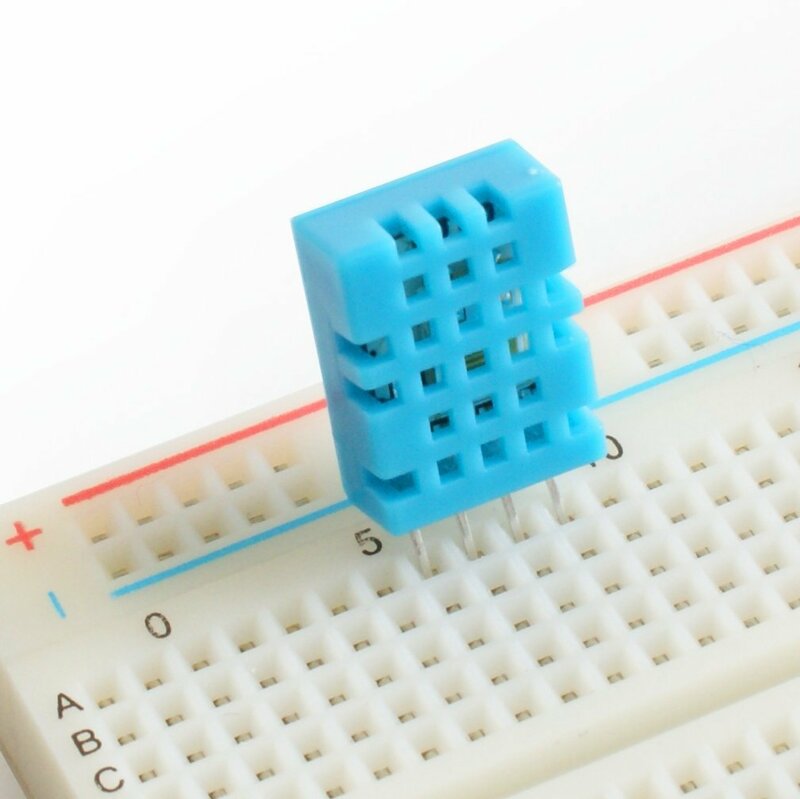 The second pin from the right of the sensor remains free. The structure is identical for DHT11 or DHT22 since the pins are assigned the same way. This creates a Python library that we can easily integrate into our projects. Attention: The sensors are only ready every two seconds. Be careful not to start a query every second. For weather stations and similar projects for monitoring the temperature and humidity, it is useful to store these values at regular time intervals so that they can be analyzed later. One possibility would be to save in local database, but this has the disadvantage that under certain circumstances, the SD card could be charged too much. What should I check next or should I erase and start over and if start over do I have to delete? Found the answer. The line in the tutorial “https://github.com/adafruit/Adafruit_Python_DHT.git & sudo python setup.py install” . After it ran and I got the errors. I changed Directory cd Adafruit_Python_DHT the sudo python setup.py install. Then sudo ./Adafruit.py 11 4 and it worked! Cyril, ‘git clone https://github.com/adafruit/Adafruit_Python_DHT.git‘ creates Adafruit_Python_DHT dir and clones there. So, you have to change dir to that one with the ‘cd’ command. The example shown is using API calls to Thingspeak to publish the values. It could be a whole tutorial on its own. I set DHT11 with my Raspberry. Normally seems it shows correct results eg. 22*/46%, but after 10 lines goes mad eg. 7*/105%. Than again turns to normal. Is it about a bad sensor? The manufacturers do not recommended that you read data from the sensor more than once per 2 seconds. If you do you may get incorrect readings. remote: Enumerating objects: 308, done. Receiving objects: 100% (308/308), 91.74 KiB | 0 bytes/s, done. Resolving deltas: 100% (168/168), done. When I run the example, I get the error ImportError: No module named ‘Adafruit_DHT’. That is probably related to the bash error above. Any help would be appreciated. Thanks. what’s the maximum distance between the sensor and Raspberry? How many sensors I can connect to one Raspberry? Also curious how many sensors you can connect in this configuration, and whether they are serialized or must have a unique pin for each assigned?